At left is Caesar and right is Maggie at our home at Christmas. Maggie was visiting when a thunderstorm occurred at our home. It was obvious it made her uncomfortable. 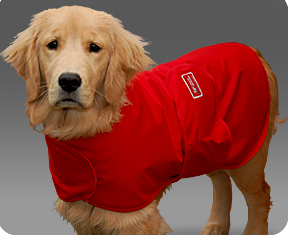 According to the Wall Street Journal there is a new product that comforts dogs during thunderstorms. It is called "Storm Defender" and is available here. Storm Defender wraps around the dog and bleeds off the static electricity while also comforting the dog (due to the pressure of the wrap). I have not tried it, but it seems to be getting good reviews.